Built in 1858, the Albright Studio was originally a Methodist church. It operated as such for about 30 years before closing its doors due to lack of parishioners and funds. Over the next few years it would change hands and serve a variety of purposes before being acquired by artist Adam Emory Albright in 1924. There he and his famous twin sons operated the Albright Gallery of Painting and Sculpture. This studio operated in the building for another 30 years and became a well-known art center in the Chicagoland region. In 1959 the building again served a variety of purposes before being acquired by the City in 1981. 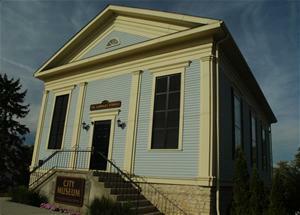 After extensive renovation, the studio served, and continues to do so, as Warrenville’s historical museum. Located at 3S530 Second Street, the studio now sits next to another famous historical landmark, the Warren Tavern. Maintained and operated by the Warrenville Historical Society, a group of volunteer residents, the studio is a great place to visit for residents wanting to learn about their local history. For more information on the history of Warrenville, visit the Warrenville Historical Society’s website or call (630) 393-4215.